Healthy used to be simple. It wasn’t the latest superfood or new diet craze – it was all about eating home-prepared meals that included fresh produce and great conversation! In my lifetime that’s changed, and it’s time that we take healthy back! I grew up thinking that what I ate only affected my waistline. 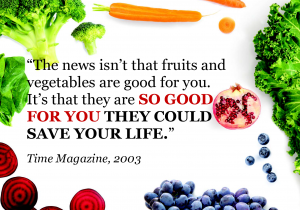 Thankfully in 2006, I learned what “whole food” really meant, and began focusing on ADDING more nutrition from fruits, vegetables, berries and other whole food sources. That simple mind shift changed everything for our family, and Juice Plus+ was a huge catalyst.